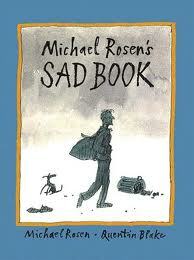 The Sad Book by Michael Rosen is all about how the poet Rosen felt when his son Eddie died. Rosen says that books are starting points for conversations. I quoted this before but find it such a powerful sentiment, I’ll add it again: “There is”, Rosen says, “a kind of magic when you put things into words, that help you sort out your feelings and realise what you feel.” The Sad Book is a children’s book meant for grown ups and children to share – it might help children realise how other people around them feel and actually share in their grief. Great pictures (by Quentin Blake) are also very powerful. Actually I liked this book for myself as an adult and think it’s best read together with children from about 7-years old maybe. 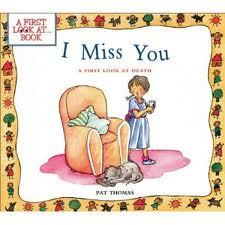 I Miss You by Pat Thomas – A picture book which talks about life and death in fairly clear, simple ways. It briefly covers a range of issues such as why people die, how you may feel when someone dies and what happens afterwards. It was interesting to us for suggesting how you might explain that a body remains but the persons soul or spirit has gone. It includes questions you can ask the child about their own experiences and a section at the back for adults on how to best use the book. No Matter What by Debi Giliori was given to us by my sister who also has young kids, and was great for trying to reassure very young children that some things do last. It’s shiny and bright and tells the story of Little Small, a fox. ‘I’m a grim and grumpy little Small and nobody loves me at all,’ says the small fox. But he finds that’s not true, and Small’s mother is determined to prove that her love is limitless — no matter what! Charming and not overtly about death but useful for very little children. Badger’s Parting Gifts by Susan Varley is a much quoted book that schools use often I find. In it, death is portrayed as a relief and release for old Badger. His friends come to realise that their lives have been enriched by his friendship and with the passing of time they are able to remember him fondly and without sadness. Actually we found it so far removed from our situation – small kids losing their Dad – that we didn’t really find it very helpful. And I suggest it’s really a bit dated. But it does introduce the idea of death with regard to older relatives. My jury’s out on this one! Muddles, Puddles and Sunshine by Diana Crossley & Kate Sheppard is a great activity book you can apply to kids of a broad range of ages. It’s very practical and suggest lots of ways its possible to help children particularly in building memories and marking special dates and occasions, as well as coping with new emotions. The Ghost of Uncle Arvie by Sharon Creech & Simon Cooper is a laugh. ‘Hammertoe!’ shouted Uncle Arvie ‘Hammer a needle with needlinks!’ Uncle Arvie’s words had been pretty mixed up when he was alive. Now he’s a ghost, it’s a crazy business trying to work out what he wants. Actually what Uncle Arvie needs is some help from his nephew, Danny, to find three precious possessions at his old home. It’s a funny story but can also help kick off conversations about your own situations and relatives. Hope they help… hope you don’t need them!